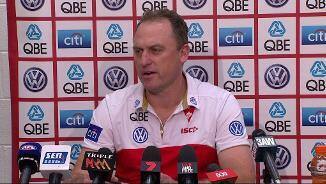 Jones: Bugg report is a "terrible look"
The Swans continue their resurgence, winning their seventh game from their last eight. 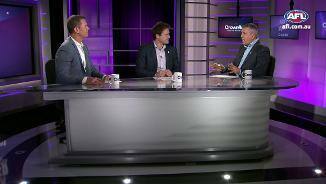 They won the contested possession count by six in the first term, 14 in the second, seven in the third and six in the last. Clayton Oliver is up to 13 disposals this quarter, two more than he recorded in the first three quarters. Lance Franklin, Sam Reid and Gary Rohan have each grabbed four marks inside 50 while Melbourne has also grabbed four. Josh Kennedy has won a gamehigh eight clearances with his eighth launching his team's first goal from this source. Melbourne has now scored two goals from 36 chains (six per cent) originating in its defensive 50. 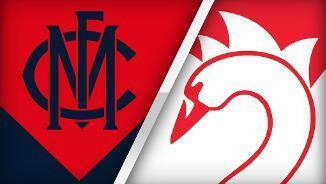 The Dees have generated a score from 10 per cent of chains originating in their defensive 50 this season. From the seventh minute of the third term the Swans recorded 13 more contested possessions and seven more inside 50s on their way to outscoring the Dees by three goals. Zak Jones has won a quarterhigh four intercept possessions with his last launching his team's eighth goal from this source. The Swans have won six of the last seven intercept possessions and generated three scores from these, including that goal to Jake Lloyd. Sam Reid just grabbed his 24th contested mark this season, ranked No.1 at the Swans and eighth in the competition. That intercept mark grabbed by Dane Rampe was just the Swans third intercept possession this quarter, six fewer than the Dees. Melbourne has generated four scores to none from this source. Melbourne has started just seven chains in its forward half and it has scored four goals from these. In comparison, the Swans have booted just three goals from 28 chains originating in their forward half. Melbourne has generated just four inside 50s from 26 chains originating in their defensive 50. The Swans have generated an inside 50 from 22 per cent of chains originating in their defensive 50 this season, ranked fifth. They have generated six inside 50s from just eight chains (75 per cent) originating in their defensive 50 in this game. The Swans won the contested possession count by 14 in the second term and lead this statistic by 20 at halftime. Dan Hannebery wins a contested possession in his team's attacking midfield and launches their 14th score from intercept possessions. Hannebery has won a quarterhigh four intercept possessions with two of them launching goals. The Swans are starting to convert their dominance on the scoreboard. They lead the inside 50 count 134 this quarter and scored the only 24 points for the term. Swans InterchangeZak Jones off due to the blood rule. Isaac Heeney is up to an equal quarterhigh eight disposals and a quarter-high two clearances as well as booting that goal. The Swans have recorded 37 forward half disposals this quarter, 26 more than Melbourne. The Swans have registered a score from 72 per cent of their inside 50s, 26 per cent higher than their season average. The Swans have recorded a kicking efficiency of just 20 per cent in their forward half this quarter and 44 per cent for the game. The Swans have recorded a kicking efficiency of 54 per cent in their forward half this season, ranked 18th. The Swans failed to make the most of their opportunities in the opening term, recording a kicking efficiency of just 11 per cent in their forward 50. Melbourne recorded a kicking efficiency of 100 per cent in its forward 50. Melbourne has won the last four clearances and booted two goals from these. Mitch Hannan's scoreboard impact is up to 161 points this season, the fourthhighest at the club. 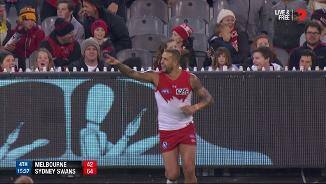 Lance Franklin has recorded seven kicks, gaining 262 metres for his team, as well as five inside 50s and three score assists, all gamehighs. After conceding the first six inside 50s of the game, Melbourne boot a goal from their first entry. The Dees have scored a goal from 27 per cent of inside 50s this season, the fourthhighest percentage of any side. Gary Rohan has already grabbed four marks inside 50, an equal careerhigh. The Demons have conceded four marks inside 50 from just five entries. 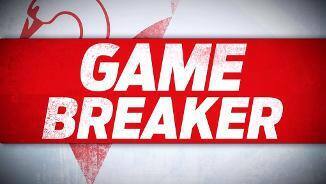 Swans InterchangeCallum Mills and is possibly out for the game. The Swans have gone in their forward 50 twice and grabbed two marks. Melbourne has conceded 11 marks per game inside 50 this season, the thirdfewest in the competition. Melbourne has won the contested possession count in 11 games this season, ranked No.1 in the competition, and it has won seven more contested possessions per game than its opposition, the thirdbest differential of any side. The Swans have won the contested possession count in their last six games, winning 16 more contested possessions per game than its opposition in this period, the best differential of any side in the competition. Welcome to MCG for the Melbourne v Sydney Swans Round 15 clash. 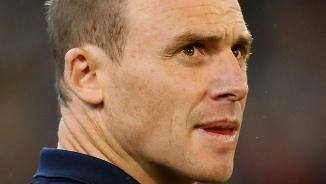 JUST nine weeks ago Sydney coach John Longmire sat at the MCG dumbfounded by his side's form. The Swans had been easily beaten by Carlton, and in turn become the first Grand Final side in history to lose the first six games the following season. Even Longmire admitted that afternoon a return the finals was a long way off. That day must feel like an eternity ago, because the Swans were back at the MCG on Friday night as they completed a comprehensive belting of an up-and-coming Melbourne by 35 points. It put the Swans back in the top-eight and confirmed them as being back in premiership contention. 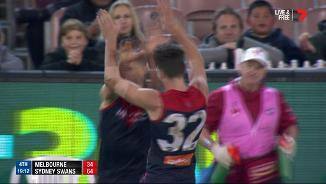 The Dees entered the clash undermanned but full of confidence after four consecutive wins, aiming to go five straight for the first time since 2006. But Sydney was the better team throughout, and eventually overcame the yips in front of goal to claim the seventh win of their past eight games since that Blues loss. Sydney's ability to run out 11.19 (85) to 7.8 (50) winners was made more note-worthy by doing it without important defender Callum Mills for almost all of the night, after he was concussed by Demons agitator Tom Bugg in the opening minutes. 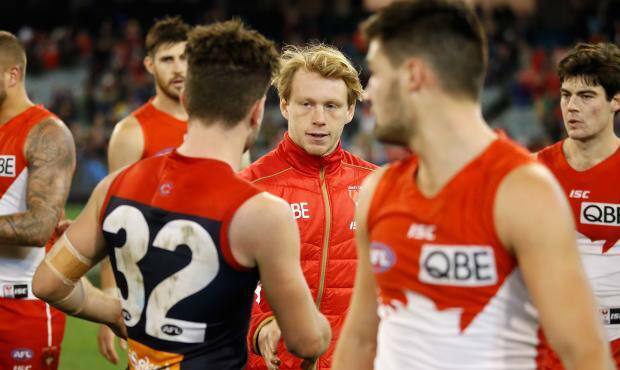 Bugg was immediately reported for the off-the-play left-hand strike which floored last year's NAB AFL Rising Star winner, and Mills sat on the bench for the rest of the game after failing the club's concussion test. Bugg faces a lengthy ban for the incident. Longmire relayed Mills' take that he was "OK" and that it had made things difficult being a player down, but didn't advocate for a 'red card' send-off rule to be introduced for similar incidents. 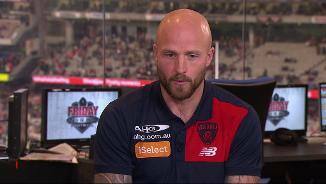 "The process will be as it should be, I'd expect, through the AFL, so we'll wait and see what happens,"
"We lost a player for 98 per cent of the game, which is disappointing." Sydney has played better games in its hot run of form over the past two months, but will be pleased with its ability to grind out the away victory. Luke Parker was exceptional and back to his best in an important midfield battle, gathering 38 disposals (19 contested) and nine clearances. Captain Josh Kennedy had 28 disposals, George Hewett had an impact with 29 touches, and Jake Lloyd pressed on with his good form (27 touches). Lance Franklin, as always, was a focal point and kicked four goals from 19 disposals. Melbourne was flat from the start and could never gain any ascendancy. The Dees' depth is being tested, with Jesse Hogan, Nathan Jones, Christian Salem, Jack Watts, Jeff Garlett and Angus Brayshaw among the regular senior players unavailable for the Swans clash through injury. That challenge looks set to get tougher before it gets easier, after Jack Viney didn't return after half-time with a plantar fascia injury in his foot. The club is unsure how long he will miss. Viney, alongside Michael Hibberd (who finished with 33 disposals), was perhaps Melbourne's best player to the main break after gathering 17 disposals. 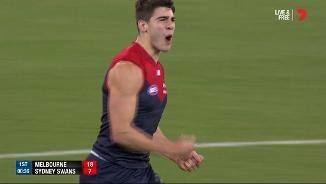 Bernie Vince (20), Tom McDonald (19, two goals) and Dom Tyson (21) were among the handful of Dees to make an impact but it was a forgetful night for a side aiming to return to the finals. "It didn’t resemble us much at all in terms of the way we played. 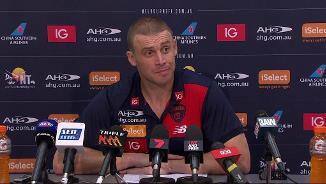 But to Sydney's credit they were very good," Dees coach Simon Goodwin said. "It certainly didn't reflect us and the way we've played through the year so it was a disappointing night from that perspective." Somehow, the Dees ended the first term 10 points ahead after weathering an early period of dominance from the Swans that saw Sydney register the first six inside-50s. Melbourne hadn't entered its own forward arc until the 10-minute mark of the term, but then surged to kick four straight goals. Parker's goal after the quarter-time siren ended a run of eight behinds for the visitors, and was good reward for their efforts given they had taken seven marks inside 50 for the term. The tight, contested style of the first quarter would have pleased the defensively minded former Swans and Dees coach Paul Roos, but really it was only Sydney's inaccuracy keeping things close as the game wore on. 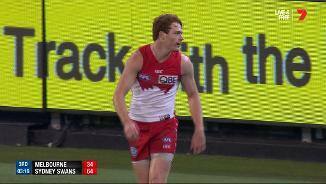 Back-to-back goals to Isaac Heeney and Kieren Jack broke the deadlock and opened up a 14-point advantage before another goal to the improving Tom Papley helped the Swans to an imposing 20-point lead at the main break. Melbourne managed just one behind for the term, lacking the zip and zest that had been evident in recent weeks. It appeared the toil of playing their fourth game in 18 days was having an impact, with the Dees listless. An early goal in the third term to McDonald bred some hope of a turnaround, but the Swans, led by the irrepressible Parker, hardened Kennedy and free-wheeling Zak Jones, responded with the next three goals to extend their lead to 30 points at the final change. It was more than enough, with the Swans shutting down the Dees and keeping them to their lowest score of the season. 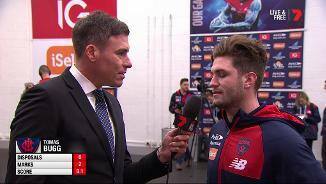 Melbourne: Jack Viney entered the game with a sore shoulder after last week's win over West Coast, but his night was cut short by a foot concern against the Swans. Viney didn't return to the field after half-time and looks set for a stint on the sidelines, with the club to become clearer about the severity of the injury over the weekend. 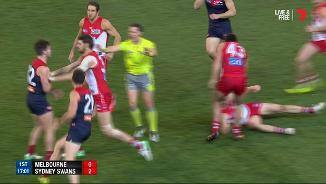 Sydney Swans: The Swans were left a player short from the opening minutes after Callum Mills was concussed by a strike from Demon Tom Bugg. Mills was floored and helped from the field after the knock, and didn't take any further part in the game. He will be assessed during the week. Sydney will look to continue its winning run next Saturday when it hosts Gold Coast in the twilight clash at the SCG. Melbourne will meet Carlton at the MCG on Sunday.